When I was 24 years old and preparing to marry, my aunt, who was a wise and strong woman, gave me a small, glass ballerina. I had studied ballet while growing up. And since I lived just outside of New York City, I was influenced by the world-renown ballet companies right outside my doorstep and I felt most inspired when watching their performances. My aunt knew that the ballerina gift really reflected who I was and symbolized important parts of my life. With this small glass ballerina was a card. And on the card, my aunt wrote, “Never forget who you are.” At the time, I did not quite get the meaning of the message and I am pretty sure that I did not fully appreciate its wisdom. I must not have given this too much more thought because 10 years after receiving the small, glass ballerina and 10 years into my first marriage, I had forgotten who I was. And because I forgot who I was, I was deeply unhappy, lost, confused and angry. I was angry mostly at myself because I had allowed someone else to define me. So, 10 years after receiving the glass ballerina who was supposed to remind me to never forget who I was, I had forgotten, and I was also getting a divorce. My aunt met my uncle when they were both 14; they started dating shortly after this; they married upon graduating from high school; they remained married for over 50 years until my aunt passed away. They were best friends and strong partners. And both of them were strong-willed. So, I am guessing that my aunt had some idea of the importance of holding onto yourself as you merge your life with another. How I wish I had spent more time trying to understand how my dear and strong and wise aunt managed, after so many years of being mostly happily married, to not forget who she was. One thing was as obvious to me then as it remains so now, my aunt was an extremely determined person. She valued herself and continually worked to carve out time for herself in spite of the busyness of life. She raised 4 children and worked full time. In addition to this, she was an extremely attentive and supportive partner to my uncle. Not only did she show an interest in who he was and support his career, she made it a consistent practice to go out on dates with him as well as socializing with their large group of friends. My aunt loved life and she loved her family. She also loved living authentically and taking care of herself. She did not allow others to steal parts of who she was or to define her. Somehow, she figured out how to be many things to many people and hold onto herself at the same time. This is how she stayed married for over 50 years, I am sure of that now. And since she knew the importance of this, she wanted me to do the same in my life and in my marriage. Every day after work around 4:30 pm my aunt would have a cup of tea and a small snack. Fortified, she would then go for a long “walk”, which was more like a jog (the few times I accompanied her, I could barely keep up). She took her walk before making dinner, before having significant conversations with her husband to engage with him, or helping the kids with their school work. This all came after the walk. She took the walk to wash away the stress from her job after her boss spent the day criticizing her, demeaning her and taking her talents as a legal secretary for granted. But most importantly, this small act, a daily walk, was a big commitment to reclaim herself over and over again. My aunt carved out consistent time to reclaim the parts of her that were just for her; time to get her in touch with her thoughts, her feelings and helped her to understand her experiences so that she could live with intention, clarity and with a greater capacity to give and receive love. Come rain, sleet, heat, ice, or snow, she would take her walk. It is part of what sustained her. It was one way she connected to herself, honored herself and did something just for herself. It was one way she did not forget who she was and one way she held onto herself while taking care of others. My aunt carved out consistent time to reclaim the parts of her that were just for her. There were other things my aunt did to express, honor and live her authenticity. The walk was just one example. But it stands out to me because it is an example of how she never let other roles, tasks, and responsibilities squeeze out times in which she claimed who she was. I did not do this in my first marriage. I gave up myself to please and accommodate and make my husband’s life easier. As a minister’s wife, much of the culture of the church dictated that I was there to assist, support and focus on my husband’s life. My life was defined by him and who he was. And there was an entire congregation of people reinforcing that this was my role. Because I felt as if this was the only option in creating a successful marriage, I gave up who I was, and I focused on helping my husband develop his career, his confidence, and his resume. I acknowledge my part and responsibility in giving myself up and allowing my life to be defined by another. It could not have happened if I did not agree to it in many spoken and unspoken ways. I went along because I thought this was how to ensure my marriage’s success. I could not have been more wrong. Instead of ensuring my marriage’s success, I was ensuring its demise. What I learned through the pain of my first marriage falling apart was that abandoning myself did not create a successful or satisfying marriage. It did not make me happy; it did not make my partner happy. It made me resentful, angry and confused. It made me feel unworthy, incompetent and unloved. Giving myself up to please another, was the way I thought I would create a happy marriage and life. It was a strategy that backfired. Instead of giving me a sense of satisfaction and fulfillment, the strategy resulted in silencing and burying precious parts of myself. And this is never a good thing, for anybody. Among all of the other emotions abandoning ourselves brings, the feelings of grief and loss are some of the most powerful emotions we experience when we allow this to happen. Giving myself up to please another, was the way I thought I would create a happy marriage and life. It was a strategy that backfired. After the divorce, I decided to make a commitment to myself to find and reclaim lost parts of myself. I wanted to learn how to hold onto myself while in being in an intimate relationship. And I knew I needed to learn how to forgive myself for the abandonment and how to heal from the losses. With the ending of my first marriage, I learned that nobody was going to do for me what I would not do for myself. Nobody was going to say, “Hey, it is time for you to focus on yourself a little. You are spending too much time giving yourself away and ignoring valuable parts of who you are.” If I did not value myself enough to do this, no one else was going to do it for me. Except, of course, my aunt, bless her heart, loved me so much that she was one person who really did try to help me. But I was not ready for what she was offering. I would have been spared a lot of heartache, if when I was 24 years old and my aunt gave me the small glass ballerina and the “Never forget who you are” message on the card, I accepted the help being offered. This is one reason why I want to help you do what I could not do in my first marriage. I want to help you recognize where in your life you have given up parts of yourself and how to start the reclamation process. And I want to help you do this while you are creating an even stronger, more intimate connection with your partner. Many years have passed since receiving the small glass ballerina from my aunt and since the ending of my first marriage. Now, I am happily remarried. And I have learned many things through the pain, struggles, and challenges of my first marriage. As painful as it was, it made me much better prepared to be a wiser, healthier and stronger partner in my current marriage. I want to help you recognize where in your life you have given up parts of yourself and how to start the reclamation process. Today I can say with conviction and confidence, that I am in a marriage in which my partner and I respect and support each other to be our unique selves while sustaining and nurturing a strong connection with each other. We are not perfect; we still make mistakes. But we understand the importance of balancing the connection with one another with time to nurture and honor our true selves. Because of what I learned the hard and painful way in my first marriage, I want to share with you some tips on how you too can learn how to hold onto yourself and nurture your own individual growth while building a strong marriage and intimate connection with your partner. If you feel as if you have lost yourself, or do not even know who you are anymore, reading this is the first step to reaching out for help and guidance. If you want to reclaim who you are while building a vibrant, thriving and strong marriage, please download my easy to read Guide. Many of us want to find a partner with whom we can share life. Many of us are looking for someone who really “gets” us and who will support who we truly are; someone who sees into our hearts and souls, someone who understands us. We want to be connected to another in love, intimacy, and friendship. We want to feel the pleasure and security of trust and being cared for…deeply. We want to join our life with the life of another and create one of joy and adventure. And often, we are prepared to do anything to have that, including abandoning ourselves. Ironically, in order to build a strong and vibrant and lasting bond with another, it is essential that each partner values themselves so much that the choice of abandoning oneself for the sake of the relationship is not an option. It is essential, that each partner understands this: in order to have a thriving, happy and healthy marriage one must value themselves so much that they have consistent time to nurture their own growth and their individual dreams, interests, and voice. I think part of what was happening for me when I abandoned myself over and over again during the 10 years of my first marriage, was that I did not value and honor myself. When I was recovering from the ending of my first marriage, part of my work was to learn how to do this. Now don’t get me wrong, there are times in every marriage when one partner puts their own dreams on hold so the other can pursue theirs. But this should be a reciprocal exchange so that over time, each partner has a turn to focus on themselves while the other is in the supporting role (and does the laundry). Love is about doing for others and giving to others. It is also about doing and caring for ourselves and allowing ourselves the gift of receiving support from others. We cannot be a healthy, happy partner to another if all we do is sacrifice; if all we do is ignore our own voice; if all we do is accommodate. Within committed relationships, when all one does is sacrifice, ignore one’s voice and accommodate to another, couples feel immensely dissatisfied. When clients express this, their grief and sadness are palpable to me in these moments. I know how it feels to be lost, a stranger to oneself. I have experienced this. And because of this, I am highly motivated to help couples do what I could not do in my first marriage: reclaim who they are as an individual, reclaim their sense of being a unique and valuable person while sustaining a strong marriage. Even when partners love and care for each other deeply… when one’s entire identity becomes defined as someone’s wife or husband, precious pieces of ourselves are lost. If you want to reclaim who you are while building a vibrant, thriving and strong marriage, the downloadable checklist is for you. We need to understand the difference between supporting and loving our partner and sacrificing all of who we are to accommodate, make another happy or avoid conflict. We can support and love our partner while we hold onto ourselves. We can disagree and still be loving and supportive. We can voice our opinion, our truth, and our perspective and still be strongly connected to our partner. We can pursue our interests and passions and also have satisfying, fulfilling marriages. Many people think you can’t have both; you can’t feel fulfilled and pursue your dreams and have a vibrant and fulfilling marriage. But I say you can if both people are willing to do the work that this requires. You can express your unique and creative self, be fulfilled, pursue your dreams and live your best life as you live connected in love, respect, and authentic intimacy with your partner. We can pursue our interests and passions and also have satisfying, fulfilling marriages. To have a satisfying, fulfilling marriage, each partner must learn how to be courageous. It takes courage to define oneself, to ask for what we want and to set clear boundaries so that we are not saying “no”, when we mean “yes”; or “yes” when we mean “no”. It takes courage to love ourselves and to honor our true nature. It takes courage to risk revealing and expressing who we truly are. It takes courage to no bury parts of ourselves to keep another happy or comfortable. It takes courage for us to be vulnerable within the relationship in which our entire life is invested. Our true nature needs nourishment just like our body does; without it, we wither. When we begin to neglect ourselves and allow other things or people or responsibilities to steal parts of us, we embark on a psychic starvation process. When we stop writing or dancing or cooking or building or painting or hiking or engaging in life or pursuing our dreams, we deny ourselves the very nutrients that feed our soul’s voice and our heart’s desires. So there are two questions we need to pay attention to. First, are you ready to examine how the losing of ourselves happen? And the second question is, can we reclaim lost parts of ourselves while nurturing the connection with our beloved partner? I believe that honoring our true self in the context of a committed relationship is one of the hardest challenges in long-term relationships. But when we do find ways to honor and express ourselves while simultaneously creating a loving relationship, we thrive in ways that bring life-affirming energy to ourselves and to the relationship. It’s a win/win for all. Are you ready to reclaim parts of yourself while strengthening your marriage? 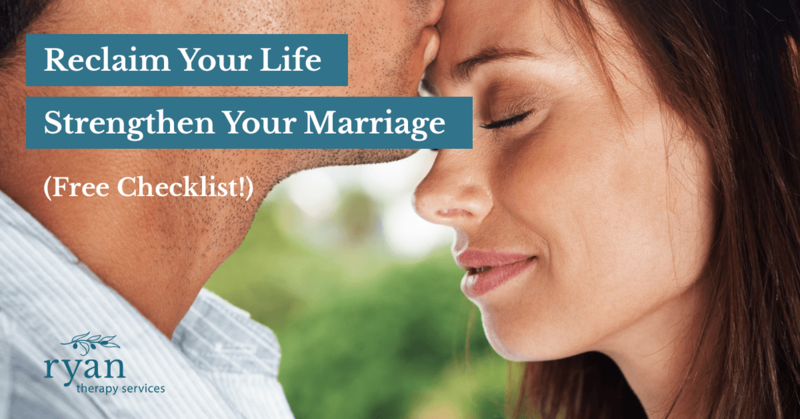 If so, please sign up for my Free Guide below for an easy to read list of things to stop doing and a list of things to start doing as you reclaim yourself and build strong, vibrant marriage.